For other uses, see Sail (disambiguation). A sail is any type of surface intended to generate thrust by being placed in a wind—in essence a vertically-oriented wing. Sails are used in sailing. Boats and ships built at around 10,000 BCE were either log rafts or dug-out canoes. Early craft include papyrus reed boats built by the Egyptians around 4,000 BCE. The Greeks and Phoenicians had begun trading by ship by around 1,200 BCE. The Arabs were using sails in about 2,000 BCE and establishing trading routes around the Persian Gulf. The Chinese were using sails around 3,000 BCE, and sail-powered traditional wooden craft can still be seen sailing off the coast of Vietnam in Ha Long Bay. Square sails mounted on yardarms perpendicular to the boat's hull are very good for downwind sailing; they dominated in the ancient Mediterranean and spread to Northern Europe, and were independently invented in China and Ecuador. Although fore-and-aft rigs have become more popular on modern yachts, square sails continued to power full-rigged ships through the Age of Sail and to the present day. Triangular fore-and-aft lateen sails were invented independently in the Mediterranean (possibly derived from the square sail through the lugsail), the Indian Ocean, the Pacific (from V-shaped sails) and Peru, and continue to be used throughout the world. During the 16th-19th centuries other fore-and-aft sails were developed in Europe, such as the spritsail, gaff rig, jib/genoa/staysail, and Bermuda rig, which give better upwind sailing ability. In an interesting recent development, an elderly trawler, TS Pelican, was fitted with what are thought to have been the unorthodox riggings used by the Barbary pirates in the 16th century. The resultant performance has been remarkable, with the Pelican sailing, at speed, over 20 degrees nearer the wind than any square rigger. Sails are primarily used on the water by sailing ships and sail boats as a propulsion system. For purposes of commerce, sails have been greatly superseded by other forms of propulsion, such as the internal combustion engine. For recreation, however, sailing vessels remain popular. The most familiar type of sailboat, a small pleasure yacht, usually has a sail-plan called a sloop. This has two sails in a fore-and-aft arrangement: the mainsail and the jib. The mainsail extends aftward and is secured the whole length of its edges to the mast and to a boom also hung from the mast. The sails of tall ships are attached to wooden timbers or "spars". The jib is secured along its leading edge to a forestay (strong wire) strung from the top of the mast to the bowsprit on the bow (nose) of the boat. A genoa is also used on some boats. It is a type of jib that is large enough to overlap the mainsail, and cut so that it is fuller than an ordinary jib producing more thrust in lighter winds. A spinnaker is also used on some boats and is used to help move the sailboat faster downwind. The spinnaker is often a colorful sail and can be either symmetrical (see the J/24 sailboat example)  or asymmetrical (see the J/80 sailboat example) . Fore-and-aft sails can be switched from one side of the boat to the other in order to provide propulsion as the sailboat changes direction relative to the wind. When the boat's stern crosses the wind, this is called gybing; when the bow crosses the wind, it is called tacking. Tacking repeatedly from port to starboard and/or vice versa, called "beating", is done in order to allow the boat to follow a course into the wind. Modern boats can sail as close as 30 degrees to the wind. A primary feature of a properly designed sail is an amount of "draft", caused by curvature of the surface of the sail. When the leading edge of a sail is oriented into the wind, the correct curvature helps maximise lift while minimising turbulence and drag, much like the carefully designed curves of aircraft wings. Modern sails are manufactured with a combination of broadseaming and non-stretch fabric (ref New technology below). The former adds draft, while the latter allows the sail to keep a constant shape as the wind pressure increases. The draft of the sail can be reduced in stronger winds by use of a cunningham and outhaul, and also by bending the mast and increasing the downward pressure of the boom by use of a boom vang. Other sail powered machines include ice yachts, windmills, kites, signs, hang gliders, electric generators, windsurfers , and land sailing vehicles. Sail construction is governed by the science of aerodynamics. Generally speaking, 2 main types of rig can be found to mount the main sails. These are square rig and fore-and-aft rig. Square rig, which reached its maximum development in the clipper ships and trading barques of the late 19th and early 20th century, relies on "square" sails hung beneath yards, themselves suspended from the masts. It requires an enormous amount of rigging (at least 9 ropes per sail)and cannot sail closer than about 60o to the wind. Few vessels of this type are seen today, other than the spectacular ones used for sail training. Most square rigged vessels also carry at least some fore-and-aft sails. Fore-and-aft rig is far more common: nearly every dinghy and yacht uses this type of rig. A large mainsail is rigged abaft the mast(s) and usually a jib in front of it. The foot of the mainsail is usually extended by a boom. Each sail needs two or three ropes for its basic control. Sails propel the boat in one of two ways. When the boat is going in the direction of the wind (i.e. downwind - see Points of sail), the sails may be set merely to trap the air as it flows by. Sails acting in this way are aerodynamically stalled. In stronger winds, turbulence created behind stalled sails can lead to aerodynamic instability, which in turn can manifest as increased downwind rolling of the boat. Spinnakers and square-rigged sails are often trimmed so that their upper edges become leading edges and they operate as airfoils again, but with airflow directed more or less vertically downwards. This mode of trim also provides the boat with some actual lift and may reduce both wetted area and the risk of 'digging in' to waves. Lightweight tapes or strands ('tell-tales') flying in the wind on sails are sometimes used to show whether the airflow in their area is laminar or turbulent. They may be on both sides near the leading edges of the sail, and more commonly at the trailing edge of a mainsail. Horizontal strips sewn into fore-and-aft sails and V-shaped markings on spinnakers assist with judging their shape from on deck. These may even glow in the dark, using luminous tapes. The other way sails propel the boat occurs when the boat is traveling across or into the wind. In these situations, the sails propel the boat by redirecting the wind coming in from the side towards the rear. In accordance with the law of conservation of momentum, air is redirected backwards, making the boat go forward. This driving force is called lift although it acts largely horizontally. On a sailing boat, a keel or centreboard helps to prevent the boat from moving sideways. The shape of the keel has a much smaller cross section in the fore and aft axis and a much larger cross section on the athwart axis (across the beam of the boat). The resistance to motion along the smallest cross section is low while resistance to motion across the large cross section is high, so the boat moves forward rather than sideways. In other words it is easier for the sail to push the boat forward rather than sideways. However, there is always a small amount of sideways motion, or "leeway". Forces across the boat are resolved by balancing the sideways force from the sail with the sideways resistance of the keel or centerboard. Also, if the boat heels, there are restoring forces due to the shape of the hull and the mass of the ballast in the keel being raised against gravity. Forward forces are balanced by velocity through the water and friction between the hull, keel and the water. Diagram showing the names of the parts of a Bermudian-style mainsail. The lower edge of a triangular sail is called the "foot" of the sail, while the upper point is known as the "head". The lower two points of the sail, on either end of the foot, are called the "tack" (forward) and "clew" (aft). The forward edge of the sail is called the "luff" (from which derives the term "luffing", a rippling of the sail when the angle of the wind fails to maintain a good aerodynamic shape near the luff). 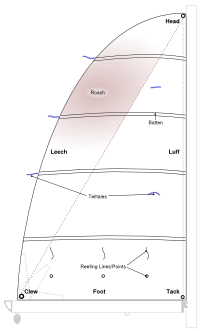 The aft edge of a sail is called the "leech". Modern sails are designed such that the warp and the weft of the sailcloth are oriented parallel to the luff and foot of the sail. This places the most stretchable axis of the cloth along the diagonal axis (parallel to the leech), and makes it possible for sailors to reduce the draft of the sail by tensioning the sail, mast and boom in various ways. Often tell-tales, small pieces of yarn, are attached to the sail. They are used as a guide when trimming the sail. An alternative approach to sail design is that used in Junks, originally an oriental design. It uses horizontal sail curving to produce an efficient and easily controlled sail-plan. Diagram of Sailboat, in this case a typical monohull sloop with a Bermuda or marconi rig. and Spinnaker or downwind sail (also termed Kite). Special-purpose sails are often a variation of the three main categories. High-performance yachts, in particular some catamarans such as the International C-Class Catamaran, have used or use rigid wing sails, which are said to provide better performance than traditional soft sails. In particular, a rigid wing sail was used by Stars and Stripes, the defender who won the 1988 America's Cup, and by USA, the challenger who won the 2010 America's Cup. Most modern yachts, including bermuda rig, ketch and yawl boats, have a sail "inventory" which usually includes more than one of these types of sails. Although the mainsail is “permanently” hoisted while sailing, headsails and spinnakers can be changed depending on the particular weather conditions to allow better handling and speed. Mainsails, as the name implies, are the main element of the sailplan. A "motor" as well as a rudder for the boat, mainsails can be as simple as a traditional triangle-shaped, cross-cut sail (see Sail Construction below). In most cases, the mainsail isn’t changed while sailing, although there are mechanisms to reduce its surface if the wind is very strong (a technique called reefing). In extreme weather, a mainsail can be folded and a trysail hoisted to allow steerage without endangering the boat. Headsails are the main driving sails when going upwind (sailing towards the wind). There are many types of headsails with Genoa and Jib being the most commonly used. Both these types have different subtypes depending on their intended use. Headsails are usually classified according to their weight (that is, the relative weight of the sailcloth used) and size or total area of the sail. A common classification is numbering from 1 to 3 (larger to smaller) with a description of the use for example: #1 Heavy or #1 Medium/Light. Special types of headsails include the Gennaker (also named Code 0 by some sailmakers), the drifter (a type of Genoa that is used like an asymmetrical spinnaker), the screecher (essentially a large Genoa), the windseeker and storm jib. Certain Genoas and Jibs also have battens which assist in maintaining an optimal shape for the sail. Spinnakers are used for reaching and running (downwind sailing). They are very light and have a balloon-like shape. As with headsails, there are many types of spinnakers depending on the shape, area and cloth weight. Symmetrical spinnakers are most efficient on runs and dead runs (sailing with wind coming directly from behind) while asymmetric spinnakers are very efficient in reaching (the wind coming from the rear but at an angle to the boat or from the side). A sail might look flat when lying on the floor but once it's hoisted, it becomes a three-dimensional, curved surface, in essence an airfoil. In order for a sail to be "built", it has to be designed in a number of elements (or panels) which are cut and sewn together to form the foil. In older days, this was rightfully considered an art which was later complemented (and arguably overshadowed) by technology. With the advent of computers, sail manufacturers were able to model their sails using special computer-aided design (CAD) programs and directly feed the data to very accurate laser plotters/cutters which cut the panels from rolls of sail cloth, replacing the traditional manual process (scissors). The key features that distinguish a "fast" from a "slow" sail are its shape related to the particular boat and rig and its ability to consistently maintain that shape. These two features rely mostly on the design of the sail (the way that the panels are placed with one another) and the sail cloth used. The traditional parallel-panel (cross-cut) gave way to more complex (radial) designs where the panels have different shapes for the top, mid, and lower sections of the sail depending on pressure of the air caused by its flow over the sail surface. Again aided by CAD and special modelling software the sailmakers use cloths of different weight, placing heavier cloth panels where there is more stress and lighter cloth where there is less to make savings in weight. Older fabrics (especially cotton and low budget synthetic), have the tendency to stretch with wind pressure which results in distorted and consequently inefficient sail shapes. Moreover, the cloth itself is heavy which adds to the inefficiency. Synthetic materials such as Nylon and Dacron were followed by advanced sail cloths made from exotic material yarns such as Aramid (e.g. Twaron, Technora or kevlar), carbon fiber, HMPE (e.g. Spectra/Dyneema), Zylon (PBO) and Vectran (see also Sailcloth). These materials were a breakthrough in sail technology as they provided the raw material in the manufacture of low-stretch, low-weight and long-life sail cloths. Manufacturers were able to use different weights of yarn to weave cloths with exceptional properties. Once the panels are sewn together (often by triple-stitch method), the sailmakers complete the sail by placing the finishing elements such as the leech and foot lines, protective patches in the areas where the sail will scrape against hardware (stanchions, spreaders), steel rings and straps at the tack and clew, cleats, batten pockets (if required) and sail numbers. Woven cloth or ribbons of high tensile fabric inserts can be "sandwiched" between two layers of PET film and placed in special ovens under pressure to bond into a single body, a process called lamination. The inserts provide the strength and the PET film the continuity and wind resistance. An alternative method is to sandwich a sheet of PET film between two layers of woven cloth. The latter process is popular when using cloth with high strength and UV tolerance, but an open weave. In the latter process the cloth protects the more easily torn PET film. A more complex sail may combine the processes. See also sailcloth. A light-weather generally weighs around 100 gram/m² and a rough-weather sail/try-out weighs around 500gram/m². In addition to advances in the exotic materials and consequent cloths themselves, manufacturers have also progressed the manufacturing process with the creation of glued and molded sails. Glued sails are regular paneled sails but instead of sewing the pieces together, the sailmaker uses a special, ultra-strong polymer glue which bonds through the use of ultrasound. In molding, a curved mold is designed and created in the optimum (three dimensional) shape of the sail that the sailmaker wants to produce. A film of PET film is placed on the mold and a special gantry hovers over the film laying the yarns based on instructions of a computer that has the model of the sail. Once this is done, a second sheet of PET film is placed on top and the whole mold (with the sail) is placed in a vacuum oven which causes the materials to bond (curing). The result is a smooth sail which is lighter and has a wider effective wind range (the minimum and maximum wind speed that the sail can withstand and be effective). North Sails introduced its successful 3DL product line, initially targeting high-end competition boats. ↑ Simon de Bruxelles (28 February 2007). "Pirates who got away with it by sailing closer to the wind". The Times. http://www.timesonline.co.uk/tol/news/world/africa/article1449736.ece. Retrieved 2008-09-10. ↑ "Luminous products for yachts, power boats and commercial vessels". http://www.glowfast.com. Search Wiktionary Look up sail in Wiktionary, the free dictionary. This page was last edited on 12 July 2010, at 14:36.